Where Does Your State Get Its Electricity? The NYTimes Knows. Using data provided by the US Energy Information Agency, the New York Times has created a graphic representation of how America generates electricity and compares today’s energy mix to what it was in 2001. The data shows the shift away from coal power that has occurred in recent years and charts the rise of electricity from natural gas generating plants. In 2001, coal was the primary source of electricity in 32 states. In 2017, that number was down to 18 states, with natural gas being responsible for most of the shift. The Times article has an interactive feature that allows the reader to view the sources of electrical energy in all 50 states. Just how (and if) we get to zero-carbon electricity is a large part of CleanTechnica’s mission. Despite the hundreds of stories we have done this year that focus on wind and solar energy, the majority of the electricity generated in America still comes from burning fossil fuels. With the current administration bitterly opposed to reducing the nation’s carbon footprint, the prospects of America leading the world toward a carbon free future are dim and getting dimmer. The official government line is that increasing production of oil and gas is a matter of national security, and there is some logic to that. Any country that is dependent on other nations for its energy is vulnerable. We learned that lesson in the ’70s when OPEC shut off the world’s supply of oil. But there are short-term concerns and long-term concerns. In the short term, a policy of “Drill, baby, drill” insures America will not be freezing in the dark this winter. In the long term, pumping more and more carbon dioxide into the atmosphere guarantees that America — and all the other nations of the world — will cease to exist in the foreseeable future. Anyone who promises to make America great again but ignores the growing existential crisis it faces is not promoting national security. Quite the opposite. 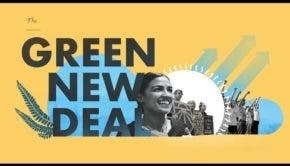 America needs a Green New Deal and it needs it now. The people of America — and the world — deserve nothing less.